These charts will give you an overall picture of your dietary standing at each weigh in point. View past weigh ins, BMI and BMR information. This will allow you visualize your dietary trends and overall progress. Our Charting system has many different ways to be adjusted to interpret your history, which include Line, Spline and Area Charts, 3D, and setting specific date intervals. One of the wonderful features of Matthews Calorie Counter is our ability to give you a “weekly” and “daily” Estimated Weight Loss (EWL), which comes in handy if you are unable to find a scale. Your Estimated Weight Loss calculations are based off of your Total Daily Energy Expenditure and Total Calorie Intake per day. Even with the most diligent TDEE and TCI record keeping, after some time, variations between your Estimated Weight Loss and your Actual Weight loss may occur. These variations between your EWL and AWL can happen from any number of reasons, ranging from metabolism to miscalculated activities or foods. To counter act this, we have created the Daily Adjustment. 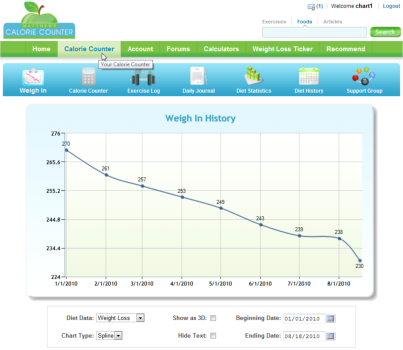 Get a quick peek at your overall weight loss progress using your weight loss ticker, updated at each weigh in. We have numerous different styles and skins to choose from, with many more being added each month. Everything you eat, every exercise, every pound lost is stored so you can see your progress over time. Visit the History Tracker page to view what you ate and did months ago.